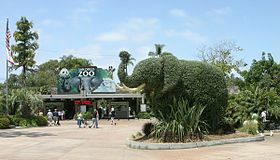 The entrance o the San Diego Zoo, Californie, Mey 2007. A zoo (short for zoological pairk, zoological gairden, or ainimal pairk, an an aa cried a menagerie) is a facility in which ainimals are confined within enclosurs, displayed tae the public, an in which thay mey an aa be bred. This page wis last eeditit on 21 October 2015, at 16:27.